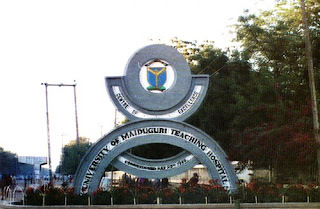 The University of Maiduguri Teaching Hospital [UMTH] School of Nursing, School of Post Basic Operative Nursing (SPBPON), School of Post Basic Critical Care Nursing (SPBCCN), School of Community Health Officers Training Programmes (SCHOTP) Admission Forms, Method of Application, Entrance Examination Dates and Venue for 2018/2019 Academic Session. Applications are invited for admission into the University of Maiduguri Teaching Hospital, UMTH for the 2018/2019 academic session. a. Candidates must have Diploma in Community Health, with two (2) years post qualification experience. b. Community Health Extension Workers with five (5) years post qualification experience. All completed application forms should be returned to the Co-ordinators/Principal's office not later than the dates stated above. All enquiries should be directed to the admission's office through their various schools (SPBCCN: 08062792908, SPBPON: 08067853503, SCHOTP: 08035482763). All payment should be made into UMTH Remita Platform "UMTH Schools Account". Present evidence of payment to the schol cashier and obtain hospital receipt and use same to collect form.